Butchers–real butchers–love it when their customers are gutsy and ask for classic cuts: Entrecôte, prime rib, pork crown roast. Too often these days the orders they fill are for skinless, boneless chicken breast or thighs, lean ground chuck, turkey burgers. Ask for a kingly sized pork crown roast, and you’ll be looked upon as Pork Royalty forever more. 1. You need to prepare the juniper brine and start brining the crown roast of pork 24 hours before you plan to start roasting it. Have ready a bowl large enough to hold the roast. Place one plastic oven bag inside the second bag to create a double thickness; then place these bags, open wide, in the bowl. Fold back the top one-third of the bags, making a collar (this helps to keep the top of the bag open). Remove the crown roast of pork from its wrapping. Place the pork inside the double-thick bags, with the rib bones pointing upward, and unfold the collar. 2. Combine the salt, sugar, sage, thyme, bay leaf, cloves, juniper and allspice berries, peppercorns, and cool water in a 3-quart saucepan. Bring to a boil over high heat, stirring to dissolve the salt and sugar. Boil for 3 minutes. Remove from the heat. Add the ice water, stir, and set aside to cool completely. 3. Pour the cooled brine over the crown roast of pork. Draw up the top of the inner bag, squeezing out as much air as possible, and secure it closed with a twist tie. Do the same for the outer bag. The pork should be completely submerged in the brine. Place the pork in the refrigerator to brine for 24 hours. 4. 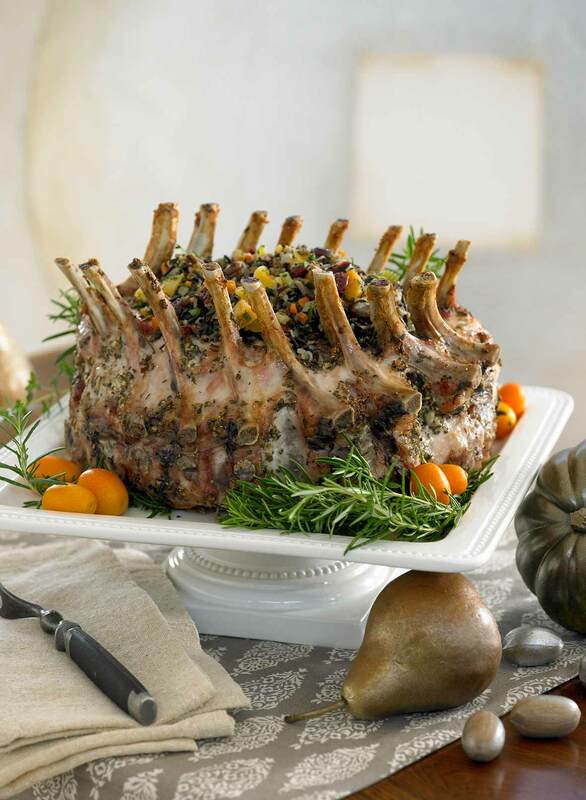 Remove the crown roast from the refrigerator 1 1/2 hours before you plan to roast it. Set the bowl aside, and place the brined pork, still in its bags, in the sink. Open and discard the bags, brine, and any herbs or spices remaining on the pork. Rinse the crown roast under cold water and pat thoroughly dry with paper towels. Transfer to a shallow roasting pan. 5. Make the herb and garlic paste by combining the garlic, sage, thyme, olive oil, salt, and pepper in a small bowl. Rub the herb paste generously over all the crown roast, including inside the cavity and between the bones. Set the crown roast, rib bones down (upside down), in the roasting pan. Set aside to marinate at room temperature for up to 1 hour. 6. Thirty minutes before you plan to roast the pork, position a rack in the lower third of the oven. Preheat the oven to 450°F (230°C). 7. Roast the crown roast for 15 minutes. Lower the oven temperature to 325°F (160°C) and continue roasting the meat for 1 hour. Check the temperature of the crown roast. The crown roast is done when an instant-read thermometer inserted into the thickest part not touching bone registers 145° to 150°F (63° to 66°C). (A 9-pound crown roast should take about 1 3/4 hours to reach 145°F [63°C]). Keep in mind that the temperature of the meat will increase another 5° to 10°F as the meat rests before carving. Let the meat rest, tented with foil, for 20 minutes to allow the juices to set. 8. Place the pork crown roast on a warmed platter so the rib bones face upward. Fill the cavity with the wild rice and scatter the remaining wild rice around the base of the roast. Alternatively, serve the wild rice or the bread stuffing on the side, or place the crown roast on a bed of herbs and fill the cavity with a bouquet of the same herbs. To carve the roast, use a carving fork to steady the roast and cut between the rib bones to separate the chops. Serve 1 or 2 chops per person. Plastic oven bags made by Reynolds are found with other food storage bags at supermarkets. Buy the turkey-size bags. They are food-safe, plus they are big, strong, tear-resistant, and come with twist ties. I do not recommend using plastic garbage bags because they are not intended for food storage. The easiest way to crush whole spices is to use a mortar and pestle or a spice grinder. If you have neither of these kitchen tools, place the whole spices in a heavy lock-top plastic bag; seal the bag, pressing out all the air; and pound the spices with the bottom of a small, heavy saucepan. 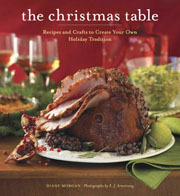 Garlic and Herb-Rubbed Pork Crown Roast Recipe © 2008 Diane Morgan. Photo © 2008 EJ Armstrong. All rights reserved. All recipes and photos used with permission of the publisher.